I think they look like a pretty useful outfit for rough trail use and might be kind of fun, too! I'm gettin' too old to be humpin' dead deer through timbered ravines filled with knee-deep snow, so one of these things looks pretty danged good to me! Have any of you guys had any experience with these things or know anyone that has? I know they've been around for a long time......ever since I was a kid, I remember seeing their ads in the 'classifieds' in all of the major outdoor magazines. They've got some videos and articles on the main site if you want to watch them.......pretty cool & beats feedin' a horse year 'round, too! I like those and think they're cool as the dickens, but at my age I'd go with 4 wheels intead of 2! With the places I have to get into I would be more hampered with 4 wheels, hence my interest in one of these things. From the list of dealers, it looks like they are clustered mostly in places that would put them to good hard use, so I take that as a good sign, too. The videos show them going through some pretty deep snow & water and the military seems to have found some use for them, also, so I am still wanting to find out more about them. Parts are pretty much standard, available-anywhere stuff, too. When I was just of high school a couple of years a neighbor bought one. He got it to get into some Elk hunting area he went to every year. I didn't pay a lot of attention to it other that to look at a couple of times. It was two wheel drive back then too and that was the draw. I see now they are $7100 and change and weigh 218 pounds dry. They are probably pretty good for old coots like us but I think you ought to ride one around a bit before you buy one. Besides your gonna need a pretty big friend to carry that thing very far. OMG I though they were long ago out of business. I thought it would be cool to have one until I saw the prices. Are you kidding me? I can get a used BMW GS for that much and drive it on the street too. My friends grandpaw had one on his ranch in the late 60's. We rode it some. Wasn't near fast enough for us kids. But it'll climb straight up, easy. Back then this thing was called "Tote Goat". I grew up in Port Lavaca, Texas. The closest thing we had to a 'hill' would be a pile of dirt next to the ditch it came out of. We rode the Tote Goat out of the ditch and up top of the pile of dirt a few times. Grandpaw also had a Honda Cub 90 and a Honda 90 Scrambler. Therefore we didn't put very many miles on the Tote Goat. Yeah, they're 'spensive alright, but I was thinking a dealer might have a used one, too I really don't care about riding on the streets and highways anymore......been there, but don't care to be anymore. The fact that they weigh just over 200 lbs. and you can walk them up on a 'bumper carrier' to carry them from place to place, plus still have the bed of the pickup free for carrying other loads is also attractive to me. Many of these new 4-wheelers are so danged big you can't get them into the puny truck beds they are making these days......THEN you need a trailer, too . I will ride before I buy, but I've got to drive to a dealer to do that and the closest one appears to be in Kansas. Until the zeal to buy reaches a frenzied pitch, I will continue to seek more info......and this too, may pass. My wife is counting on it! Yellow Jacket I think, although I could be wrong, that Tote Goats and what Wolfy is talking about with the Rokon 2 wheel drive Trailbreakers were two different machines. Tote Goat went under in about 1970. Rokon is still in business. Yeah, I remember those things, but the only ones I ever saw were yellow and your Wiki article says ther were red, green etc., too. I saw one in Casper, WY that some kid had obviously changed the sprockets on. It had to be going 65 mph That must have been a nice handling machine! Never mind. Well, in case Tote Goat goes back into business, they'll pull little bitty stumps. Sure seemed a lot bigger and badder back then. When I lived in Colorado and fished and hunted the mountains we would see Tote Goats once in awhile. I thought they were just low geared scooters but I guess they worked okay. Not like a Rokon though. There are a couple of them on Ebay and this one is just what you need, want, and desire. That sounds like one of those early 60's Mustangs. They looked a bit like a Tote Goat but had about 12 hp and were fast (to a kid used to riding a Honda 50). My Honda 50 was the one that looked like a conventional motorcycle (as opposed to the step through model). It wasn't bad around town and could actually get to about 55 mph on a slight downhill run. On trails it was so so until you got to about 9,000 feet elevation and then it was the little bike that couldn't. The trail model would have been much better, except for the sprocket changing for highway travel. I graduated to larger bikes like Triumph and wound up with a 750 Honda four the first year they came out. It was a crummy trail bike too. I saw a great looking honda 50 at a used car dealership the other day. You don't know how tempted I was to stop and see what they wanted for it. The GOOD one's are REALLY expensive . I wonder how many of them they'd sell if they started importing them again? You see them all over the streets in news footage from VietNam, Thailand, India, etc. What surprises me is the Chinese manufactures have not started selling a clone of them like they did the 250 honda Rebel. 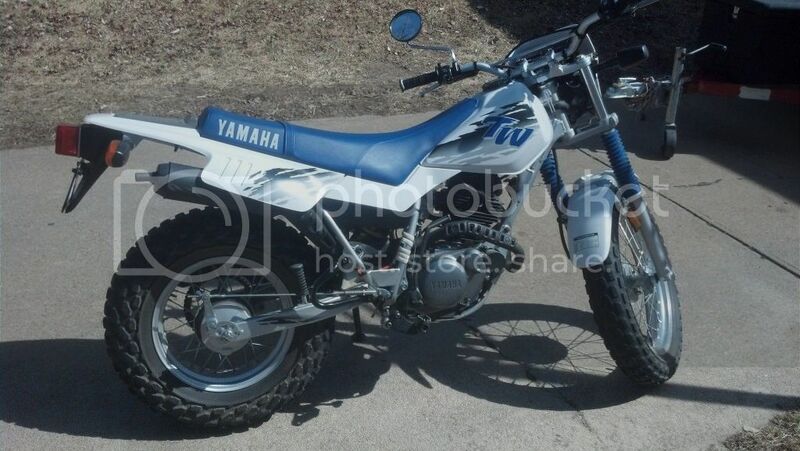 If I didn't have a KDX 200 a good Honda 50 trail bike would be on my list. For now I am waiting to see what kind of Rokon Wolfy gets. Good looking bike. I sure do miss mine at times. Last dirt ride was a Suzuki DR500. Dang Wolfy, that looks like you just wheeled it off the showroom floor...it's GREAT looking!!! I hope you enjoy it and it works out the way you intend...I'm sure it would be nice to save a few steps from time to time. I can't get over the pic...awesome for a '99!!! Ya did good wolfy. We need pics of you riding it now! And don't try that stuff Evel Knievel did. Nice! Good find. Put some chains on those tires and come visit. LOL, You'd better start stocking up on snacks, dig out some of your good reading material, and maybe invest in a good used wheelchair, I have a picture in my head of you in a body cast trying to sip your beer out of a straw, it reminds me of my Dad when he turned 70, my brother showed up at Dad's place on his horse, Dad being born in 1911 went to work at 11 yrs. old as a teamster driving a horse drawn freight wagon in summer and hauling block ice in winter was a fair hand with horses, so he got the idea he was going to go for a ride, I and my two brothers tried to talk him out of it, but there was no use wasting our words. Dad climbed up (with a little help) into the saddle, setted into the seat, took up the reins, and heeled the horse gently, the horse bucked once sending dad in the air, he did a complete flip around and landed on his back hitting the back of his head on the driveway pavement. After the ambulance ride he woke up in the ER with a really bad head ache and an over night stay, the doctors told him he was very lucky he didn't break his fool neck. But good luck with your new toy my friend, I've had bikes most of my life, I sold my last one about ten years ago, and I often think about buying another, it's a good thing my wife has better sense than I do. Moe, I would rather go out with something I really like doing than die in my easy chair. Us old guys can still do anything, just once though and a little slower. "I may not be as good as I once was, but I'm as good once as I ever was". on Craig's List in Omaha. Old buddy of mine out in Oregon has used a Rokon for years. He swears by it. Now we need a picture of you in your bib overalls riding it. I will bet you look just like Fonzies farmer cousin. Anyone got a shark tank? The Rukon has been on the wish list for ages, going back to when I was a kid. PTO attachment, a rim that holds gas, and the thing can climb a house. What is there not to like. Congrats Wolfy, that bike looks nice. Are you going to put some saddle bags on it and pack up for camping, or just ride for fun as is? Cool bike, I like it. Thanks, Unk! Due to the hip surgery, I couldn't really ride on it comfortably up until just the past couple of weeks. It is licensed and insured now, but I've only passed the written portion of the motorcycle endorsement that I need to have to ride it on the street, legally. I couldn't do the driving portion of the test because it was raining and the examiner won't do that portion of the test when it is. Since the examiners are only here once a month, I have to wait until the first Thursday in August to take the rest of the test. I've only got a couple of blocks of 'city' driving to do to get out to the farm on a minimum maintenance road, but with my luck I'd get busted by a state patrolman when I was trying to get back home on those two blocks of asphalt that I need to traverse. I do plan to get a rack made so I can add some pannier-type bags for hauling some basic camping gear, but haven't decided exactly what I need to accomplish that with yet. I foresee some Wilderbeast-brand surplus bags of some kind......cheap and easy to adapt for the purpose intended with a low center of gravity. Do you know the location where the test is given? I used to take all my buddies down there when they were not giving test and show them how to pass it. The cone weave is not a give me by any means and neither is the U turn. The cones are not in a straight line but they are off set. That can be a pain on a bike with a long wheel base. Look where you want to go not what you want to miss. Well, that's one thing I don't have to contend with on the TW.....the wheelbase is ultra-short, but I do plan to get it out to the farm to practice a bit with it, so I don't run over the examiner's foot or something during the test. http://www.bikesafer.com/msf_brc_review_range.html for the details on what to practice. Now I think the course is worth taking. I had my license but my son and his friend wanted to take it so I went with them mostly to make sure they actually went. One of the instructors was a police motorcycle officer. He saw that I could ride so he told me I had to do it better than everyone else. By the end of the day he had me doing full 360s with the bars all the way to the locks. I really had a blast. Very useful information and insights on what to expect in the test.....THANK YOU! I'll practice some of those things when I get the bike out to the farm......I've apparently been putting too much emphasis on doing wheelies. I was once told polygamy is like doing a wheelie. It looks cool but is hard to do for very long. Doug Domokos could do wheelies but I don't know how he would have handled polygamy. The diversity would be interesting though. You will do great Wolfy as you know how to drive farm stuff. EDIT: BTW.......I passed the riding portion of my motorcycle licensing requirements with flying colors. I've been terrorizing the rural countryside, back roads, river trails, etc. for about 3 weeks, now. I'm loving riding the bike again after the 50 year hiatus.......the TW200 was a great choice! WOLFY APPROVED! Sold it and bought a 95 Suzuki 4 wheeler.... still small enough to fit in a 6 X12 cargo trailer....still got it. Actually tried a Rukon back when...was big and heavy if memory serves me.......so bought the Yamaha ....was a better price and could ride it on the road as well. I just filled up my gas tank last night after a 25 mile ride out into the northeast Nebraska wilderness. Since I'd recorded the miles on the odometer last time I filled up, I decided to check the gas mileage for the first time and even with mostly 3rd & 4th gear driving on minimum-maintenance roads the mighty TW200 came through with a a miserly 59.45 mpg..............a pleasant shock from what I'm used to with the pickup. Last two fill-ups revealed even better mileage on the TW200....80.0 mpg & 77.4 mpg .....mostly evening 10-15 mile trips out to the state park to practice my cornering skills on the twisty park roads, emergency stopping, etc. Fuel bill racks up to the tune of less than $.03/mile.....I can live with that and still have some leftover Social Security Obama-Bucks for a double cheeseburger off the 'dollar menu' at Burger King!